Nelson’s Column is one of England’s most iconic sites. It is located in London’s Trafalgar Square. It was built to commemorate Admiral Horatio Nelson. He was a British officer who served in the Royal Navy and died at the Battle of Trafalgar in 1805. The construction of this national monument was mostly funded by private donations. In today’s money, its value is more than £3 million. The structured was designed by William Railton as he won a protracted competition. In 1867, the four bronze lions were added to Nelson’s Column which are sitting at the base. These lion sculptures were designed by Sir Edwin Landseer who used a dead lion as the model. The lions were made out of metal from guns that had been taken from old battleships. On the top of the column, a statue of Admiral Nelson is situated measuring 18 feet 1 inch in height. The monument is built in the style of ancient Greek and Roman architecture called the Corinthian order. It was built between 1840 and 1843. There are four panels at the bottom of the monument each depicting a scene from Nelson’s famous battles. These panels were also made from the metal from captured French guns which were melted down. In 1896, Nelson’s statue was struck by lightning and his shoulder got chipped. Declan, Tobin. " 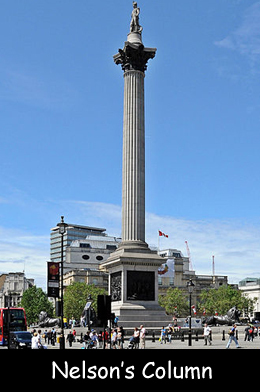 Facts for Kids about Nelson's Column ." Easy Science for Kids, Apr 2019. Web. 26 Apr 2019. < https://easyscienceforkids.com/nelsons-column/ >.